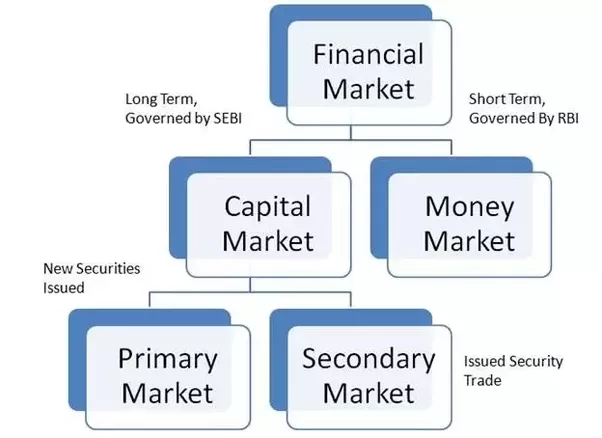 Financial Market refers to a marketplace, where creation and trading of financial assets, such as shares, debentures, bonds, derivatives, currencies, etc. take place. It plays a crucial role in allocating limited resources, in the country’s economy. It acts as an intermediary between the savers and investors by mobilizing funds between them. 1. Stock Markets: Stock Market is a type of Capital market which deals with the issuance and trading of shares and stocks at a certain price. 2. Bond Markets: Bond Market is a form of capital market where buyers and sellers are involved in the trading of bonds. 3. Commodity Market: A market which facilitates the sale and purchase of raw goods is called a commodity market. Commodity market like any other market includes a buyer and a seller. In such a market buyer purchases raw products like rice, wheat, grain, cattle and so on from the seller at a mutually agreed rate. 4. Money Market: As the name suggests, money market involves individuals who deal with the lending and borrowing of money for a short time frame. 5. Derivatives Market: The market which deals with the trading of contracts which are derived from any other asset is called as derivative market. 6. Future Market: Future market is a type of financial market which deals with the trading of financial instruments at a specific rate where in the delivery takes place in future. 7. Insurance Market: Insurance market deals with the trading of insurance products. Insurance companies pay a certain amount to the immediate family members of owner of the policy in case of his untimely death. 8. Foreign Exchange Market: Foreign exchange market is a globally operating market dealing in the sale and purchase of foreign currencies. 9. Private Market: Private market is a form of market where transaction of financial products takes place between two parties directly. 10. Mortgage Market: A type of market where various financial organizations are involved in providing loans to individuals on various residential and commercial properties for a specific duration is called a mortgage market. The payment is made to the individual concerned on submitting certain necessary documents and fulfilling certain basic criteria.